Joseph William Namath (born May 31, 1943) was an American football quarterback for the American Football League's New York Jets in the 1960s. He is best known for predicting his team's unlikely victory in the third AFL-NFL World Championship Game, over Don Shula's NFL Baltimore Colts (currently known as the Indianapolis Colts). Namath was born in Beaver Falls, Pennsylvania and was a star player in football, as well as basketball and baseball, while in high school. When he graduated he received offers from six Major League Baseball teams, but decided instead to avail himself of one of the many offers from college football programs, and attended the University of Alabama, playing under coach Bear Bryant from 1962-65. During this period the Crimson Tide rose to become a national force in college football. In the 1965 college draft, Namath was passed up by the NFL as "too expensive". Signed to the AFL's New York Jets team by Hall of Fame owner Sonny Werblin, Namath was the first pro quarterback to pass for 4,000 yards in a season (1967). He was a three-time American Football League All-Star, although plagued with knee injuries through much of his career. Still, he produced many exceptional performances, one of which came in the 1968 AFL title game, when he threw three touchdown passes to lead New York to a 27-23 win over the defending American Football League Champion Oakland Raiders. This 1968 season earned him the Hickok Belt as top professional athlete of the year. The apex of his career was almost certainly his role in the Jets' win over the Colts in the third AFL-NFL Championship Game. The Colts were touted as "the greatest football team in history". Former NFL star and coach Norm Van Brocklin ridiculed the AFL before the game, saying "This will be Namath's first professional football game." Writers from NFL cities insisted it would take the AFL several more years to be truly competitive with the NFL. In the actual game, Namath showed that his success against tough American Football League competition had more than prepared him to take on the arrogant NFL. The Colts' once-vaunted defense was unable to contain the Jets' running or passing game, while their ineffective offense gave up four interceptions to the Jets. Namath was the game's MVP, completing eight passes to George Sauer alone, for 133 yards. Namath acquired legendary status for American Football League fans, as the symbol of their league's legitimacy and the patron saint of underdogs. He is a member of the Jets' all-time team, the All-time All-AFL Team and the American Football League Hall of Fame. With Boston Patriots receiver Jim Colclough and NHL star Derek Sanderson, Namath opened a popular Upper East Side saloon in New York City called "Bachelors III," which quickly became frequented by social undesirables. 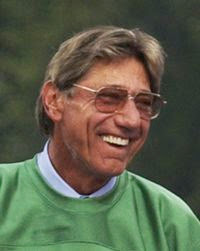 To protect the league's reputation, the NFL Commissioner, Pete Rozelle, ordered Namath to divest himself of his interest in the bar. Namath reacted defiantly, retiring from football during a teary news conference. After missing most of training camp, Namath came out of retirement and reported to the then-World Champion Jets. At the same time, he announced that he was selling his interest in "Bachelors III". Namath's nickname was "Broadway Joe"; he is sometimes called "Joe Willie Namath". He originated the fad of wearing a full-length fur coat on the sidelines, a habit which was adopted by many players after him. He still appears in advertising today (2003). In December 2003 he gained notoriety, apparently after partaking of too much celebratory champagne at the Jets' announcement of their all-time team. During live ESPN coverage, he twice stated he wanted to kiss Suzy Kolber, the female interviewer. He has since apologized. Later, he publicly admitted to an alcohol problem, and is currently undergoing outpatient alcoholism treatment.